Understated and luxurious, the feeling of being wrapped up in a soft washed linen bathrobe will make all your worries fade away. 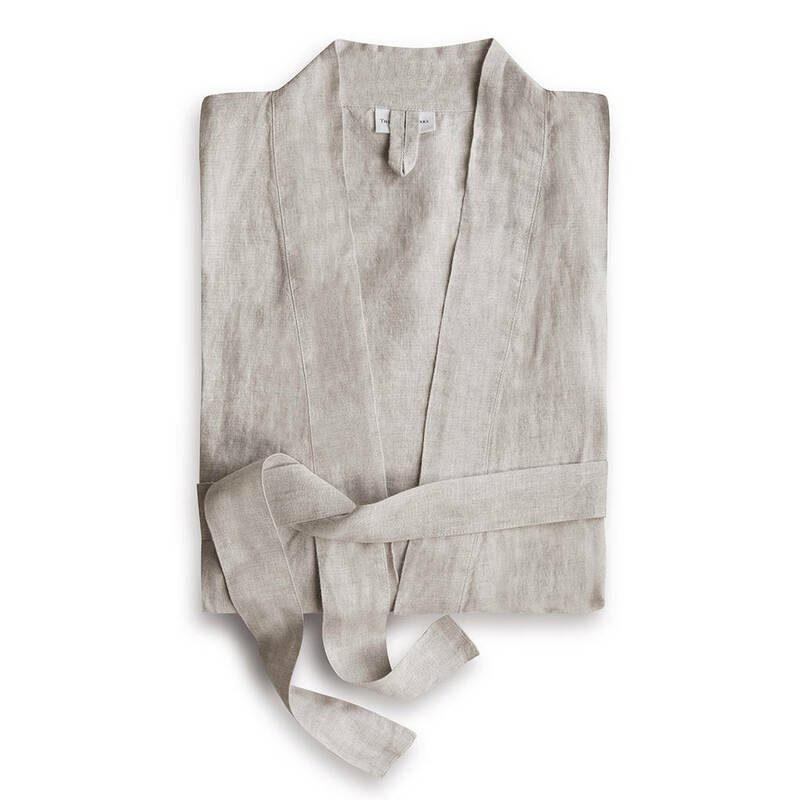 Get your cup of tea ready, wrap up in a lightweight linen bathrobe and you'll be ready to face the day. They feel lovely on the skin and come in soft muted colours that will make you feel instantly relaxed. The perfect gift for anyone looking for a little pampering in their life. As seen in Country Homes and Interiors magazine. A visit to a rustic farmhouse overlooking the Bay of Toulon is where The Linen Works all began. The house was well loved, lived in and told a story with pieces to treasure. Its pared-down style and simple yet useful things is what still inspires our creations today. Today, The Linen Works range spans across linens for the bedroom, bath, table, kitchen and everyday living. Our linen Bath Robe is also available in Aubergine, Parisian Blue, Rose, Ecru, and Classic White. You can also bespoke your linen with our monogramming service. The tradition of embroidering linen allows for the perfect opportunity to make a household item into a romantic keepsake, or even a family heirloom. Choose your own text such as children's names, initials or memorable dates in a scripted font in a choice of either White, Grey, Rose or Charcoal thread. Maximum 15 letters. This service has a 2 week delivery time.Cost covers up to 15 characters. 100% Washed Linen. Bathrobes are pre-washed for extra softness. Machine washable 40°C. Our pre-washed linen is especially easy to iron.